Republican lawmakers in New York are backing Senate Leader Dean Skelos amid a federal investigation into whether he influenced Nassau County's decision to award a $12 million contract to a company that hired his son. Sen. John DeFrancisco told reporters Tuesday that Skelos is innocent until proven guilty. Sen. Kenneth LaValle says it would be "presumptuous" to rush to judgment. 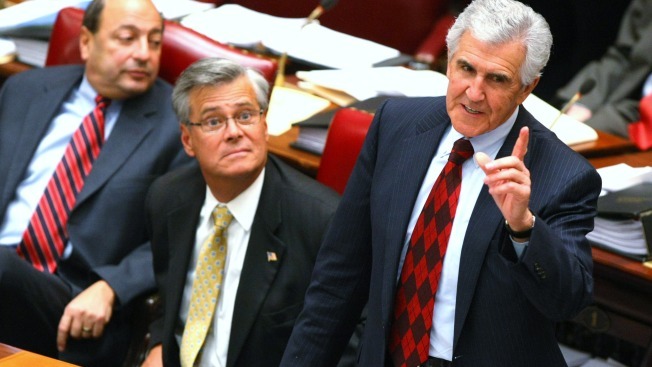 Skelos did not address reporters before the Senate reconvened Tuesday following a two-week break. He said last week he was cooperating with investigators. Skelos lives in Nassau County, which awarded the $12 million stormwater contract to an Arizona company even though it did not submit the lowest bid. NBC 4 New York's I-Team first reported in January that Skelos was being investigated for his ties to the real estate industry, among other things. News of the investigation came three months after former Assembly Speaker Sheldon Silver was accused of accepting nearly $4 million in payoffs.